Happy Valley, looking back at Mt Buffalo. The Hume Dam arm near Tangambalanga. 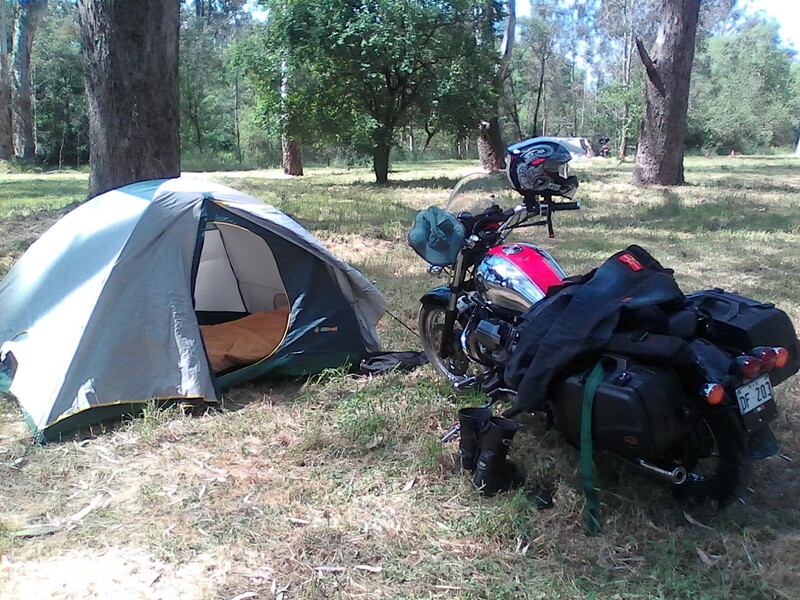 Over several days, I conducted the 60,000km service on my ’06 Breva 1100. Before taking the tank off, make sure that you have a safe place to place it. As usual, it took me some time and swearing to release the fuel line “quick” disconnect fitting. The rocker cover gaskets were the originals – 10 years old. This time, one tore as I removed the cover so I replace both of them with the new rubberised metal type. Checked the tappets but no adjustment was need. Changed all the fluids, the air and oil filter. Ryco now make oil filters for motorcycles so, rather than use their Z418, which I’ve always used in my Breva and Cali, I installed their RMZ126. Used Penrite’s fully synthetic 10W-60 oil for the engine, with its high zinc content for flat tappet engines, and their 80W-90 gear oil for the gearbox and rear drive. Used some tin foil to direct the old oil into the container. For the first time, I removed the suspension linkage and and regreased the roller bearings. Fiddly bloody job, but quite straightforward. Placed a jack under the swingarm to release the suspension tension, and the linkage came out easily. I wanted to do the swingarm bearings, too, but piked out. I spent some time cleaning every electrical terminal I could find with a wire brush until they shone like a spoon. I also recently dowloaded the Guzzidiag software and obtained the cables from Lonelec to connect to the Breva’s ECU. This allowed me to reset the TPS. It has many other functions which I intend to investigate. Gave the girl a thorough clean and now she’s all set for another 10,000km. 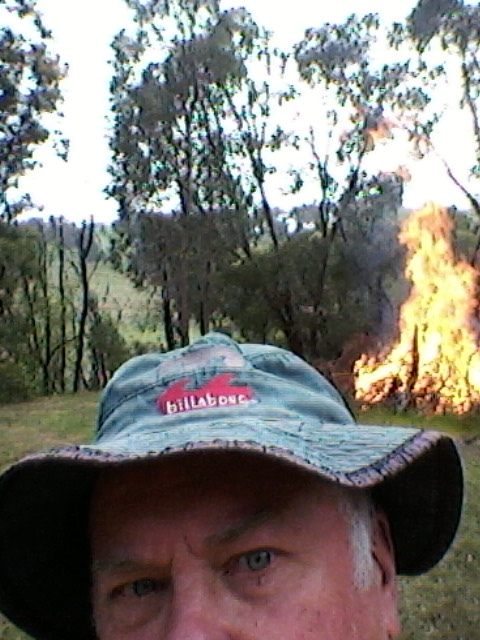 After a life-changing experience – losing our home in a bushfire – I finally pulled the pin and retired. 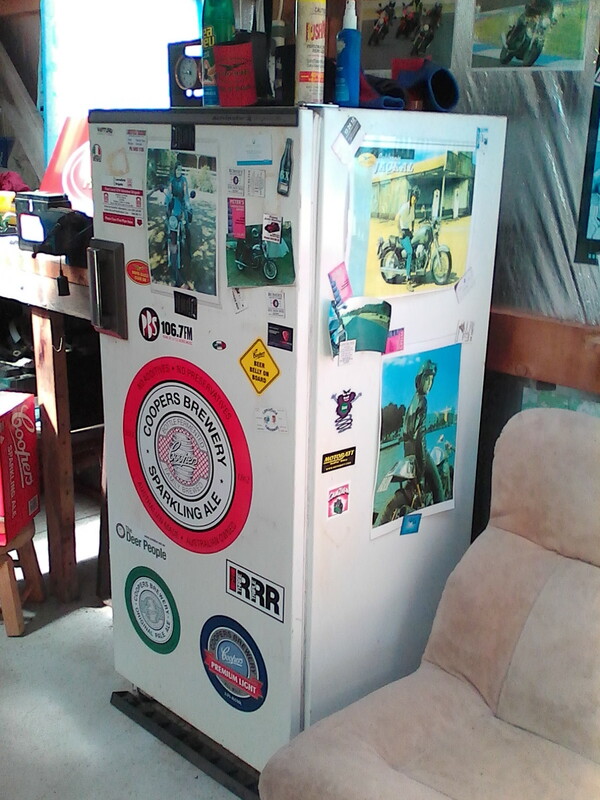 Busy with a new home in a new town didn’t leave much time for motorcycling. 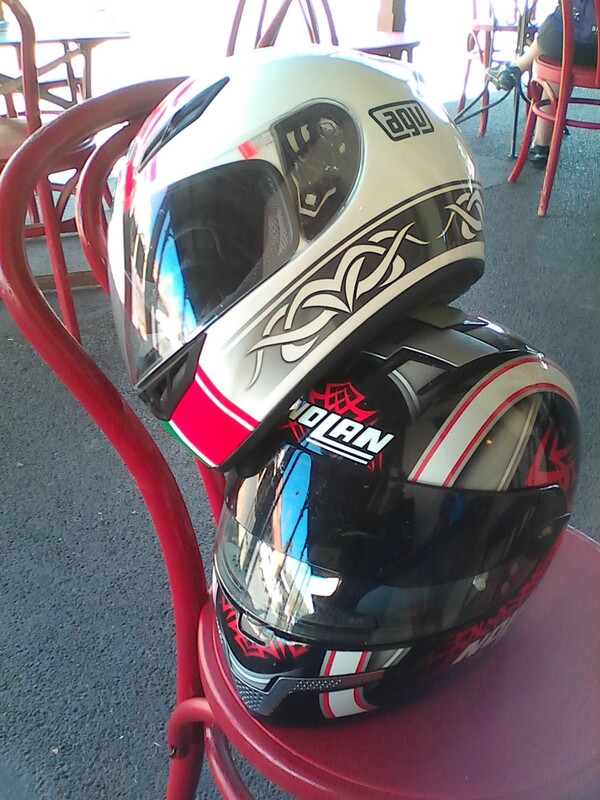 But we finally hit the road on some local rides before winter set in. 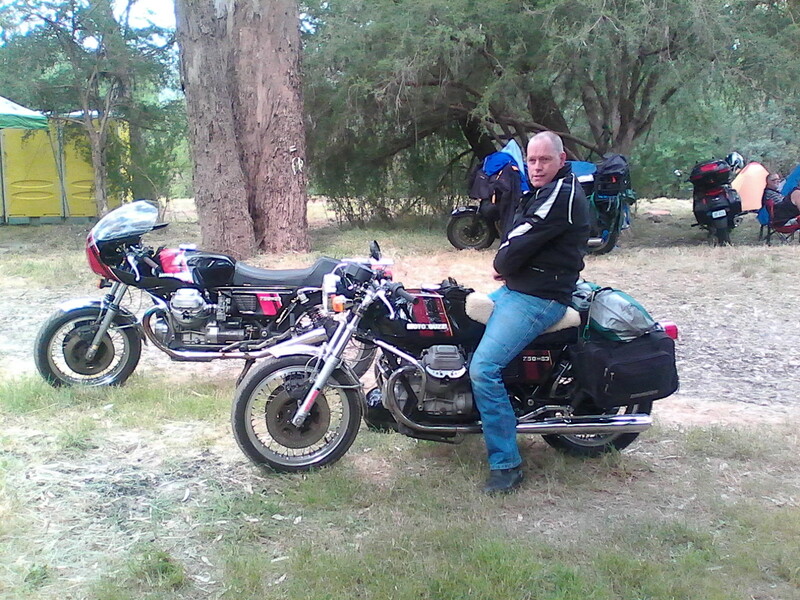 The Chief and I went on the Moto Guzzi Club of Victoria’s annual Great Spring Run (to shake off the winter blues). The club meets at the European Restaurant in Spring Street, Melbourne, then tracks out the the north-west to pick up the Geelong contingent. 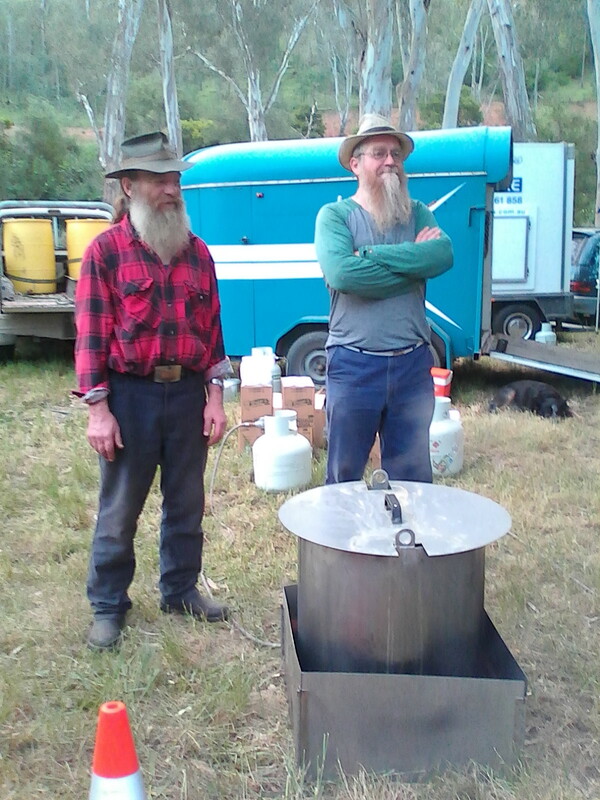 This year we had lunch at the Radio Springs Hotel in Lyonville. 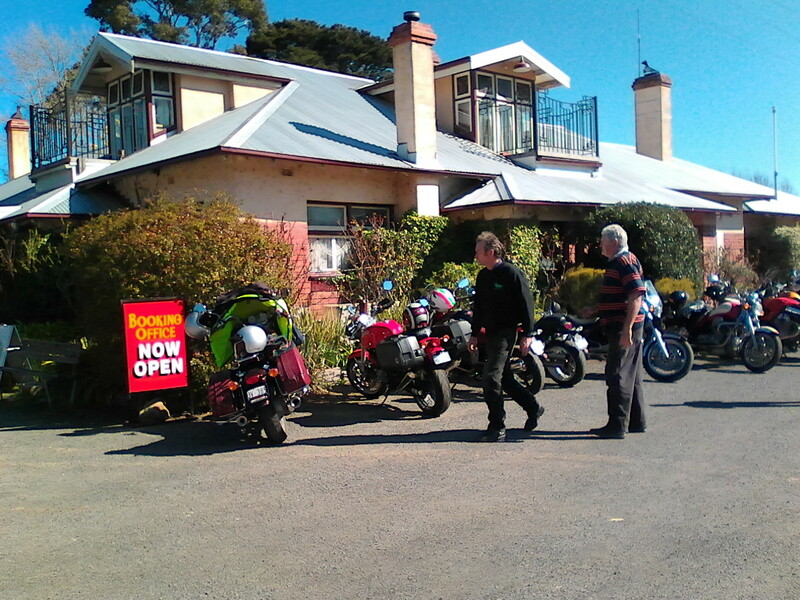 With a club record number of 41 bikes rolling in, the hotel did an excellent job of feeding everyone. 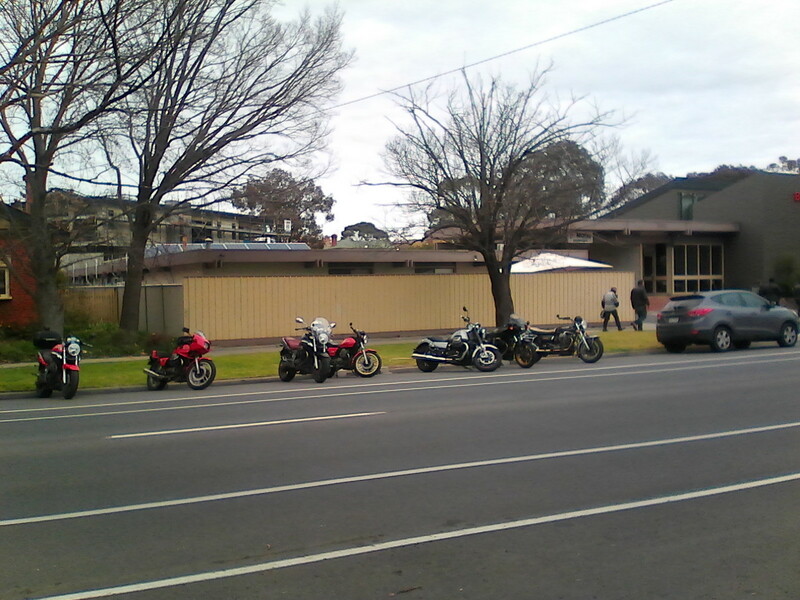 I joined the ride at Lancefield. 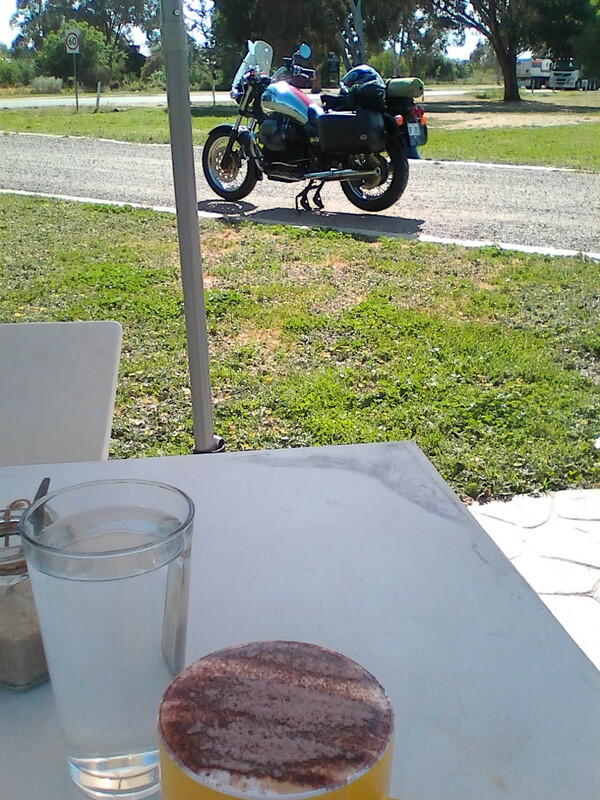 It was 6C when I rode the Breva 1100 into town at 10 am and I stomped around with very cold feet with another chap from Daylesford. No wind, though. 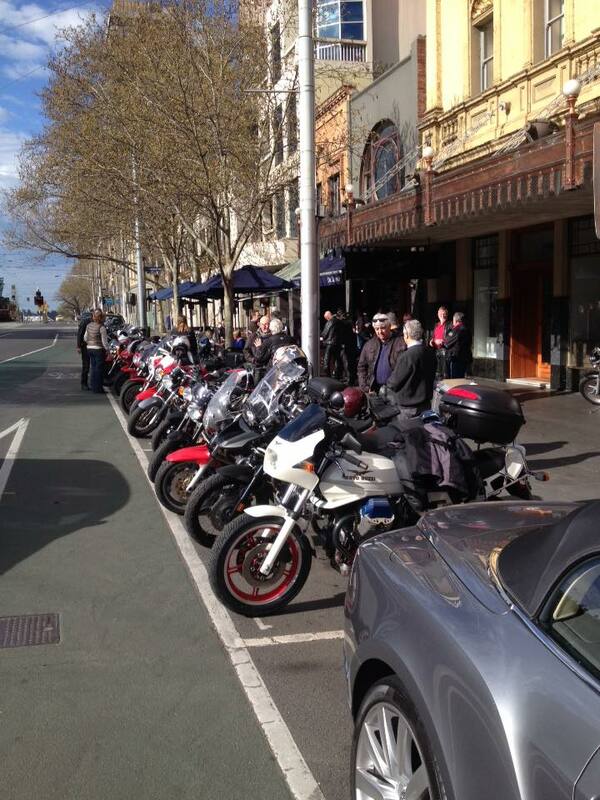 Eventually the guys and girls rolled into town for a coffee – 30-odd bikes – then we were off. Ash, the ride leader, set a cracking pace which I did not try to emulate. 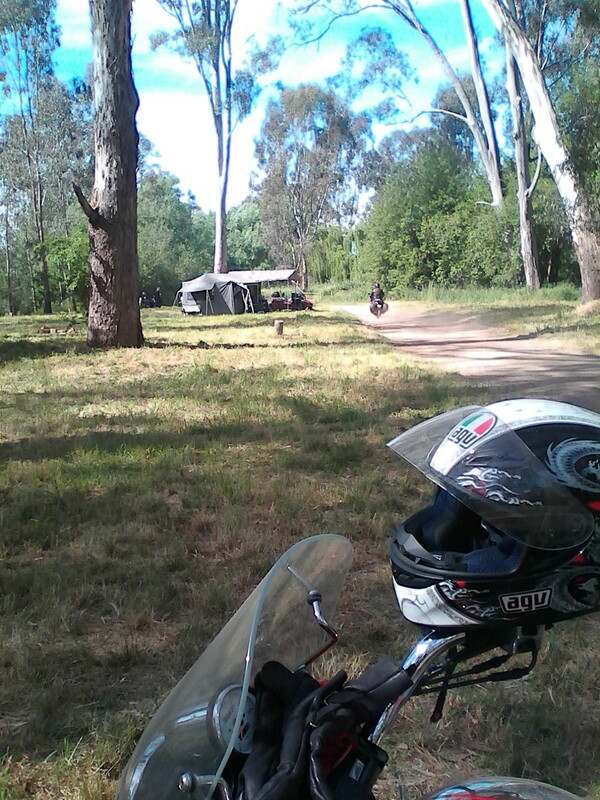 He took us over various roads including Burke and Wills Track, which I detest – it’s narrow and rough – and that’s on the sealed bits! We pulled into the Brougham Arms for lunch. Quite nice, good service and menu and plenty of parking for bikes. Adam rolled in from South Australia with a Centauro he’d bought the day before. 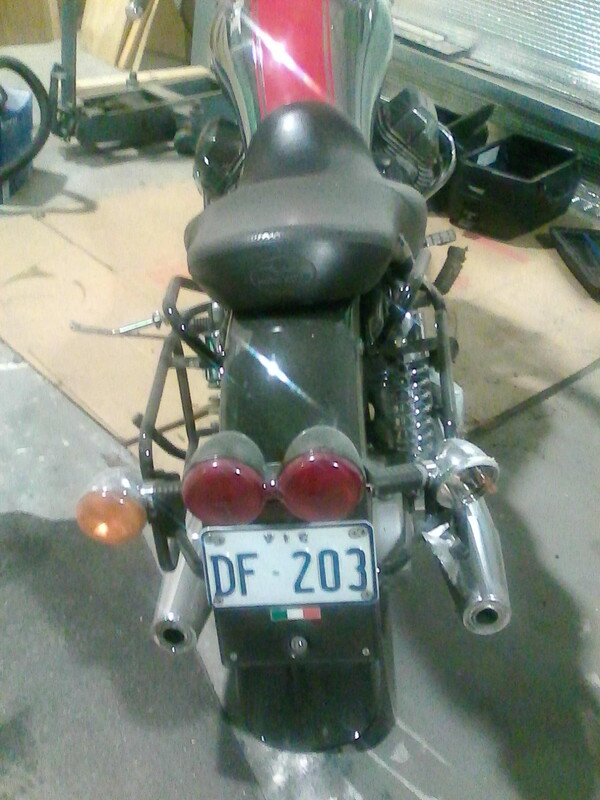 The oil over the left side of the bike was a real pisser and depressing until Pierre had a look and pronounced a leak from the oil pressure sensor. Fortunately our new Presidente had come in his Falcon ute (don’t ask why, it’s too embarrassing) so the Centauro was freighted to Melbourne for surgery. After visiting a private collection of Indians (motorbikes!) the club went one way and I headed the other. It was 7C as I entered Lancefield at 4 pm. Too smegging cold! 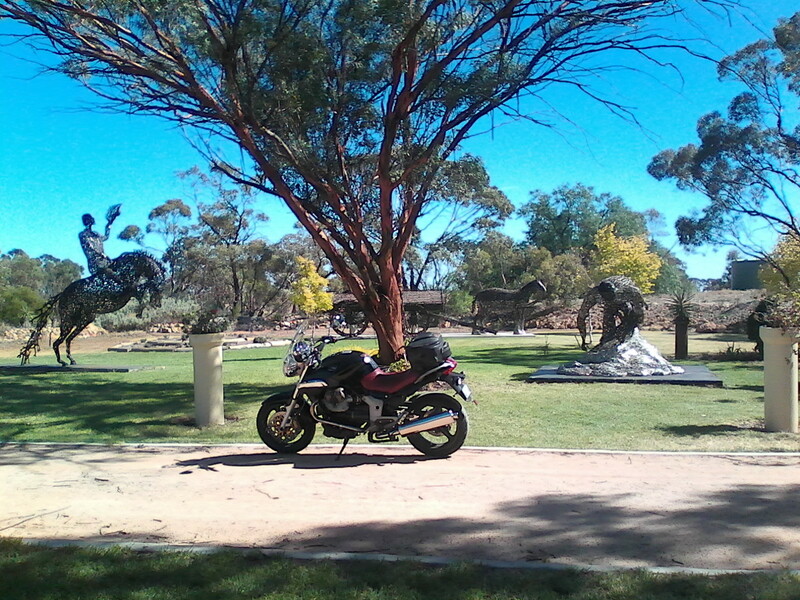 Finally got back into the saddle with a run up to Boort with the Moto Guzzi Club of Victoria for the marque’s 94th birthday. 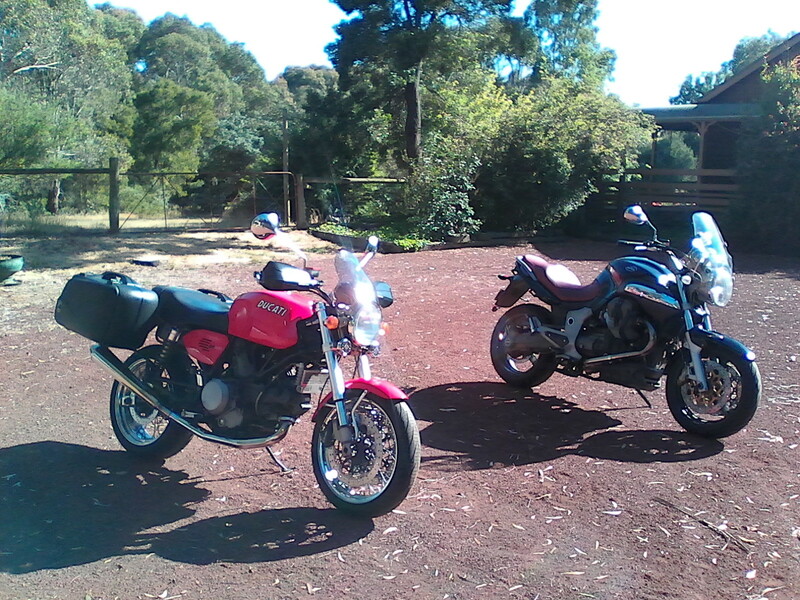 Flogged the Breva 1100 up via the old Calder Highway with Jane on her Ducati GT1000 via Maldon and met up with others at Bridgewater. 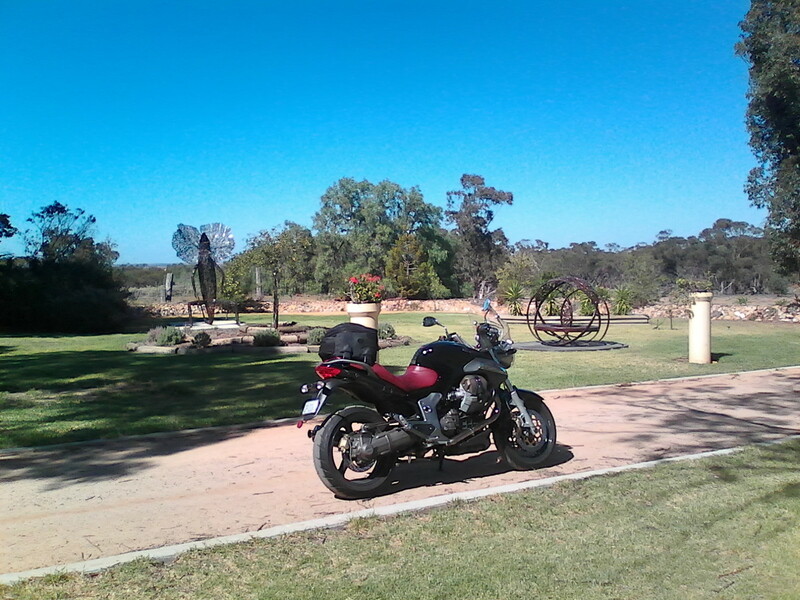 Then backroads from Inglewood to Boort. 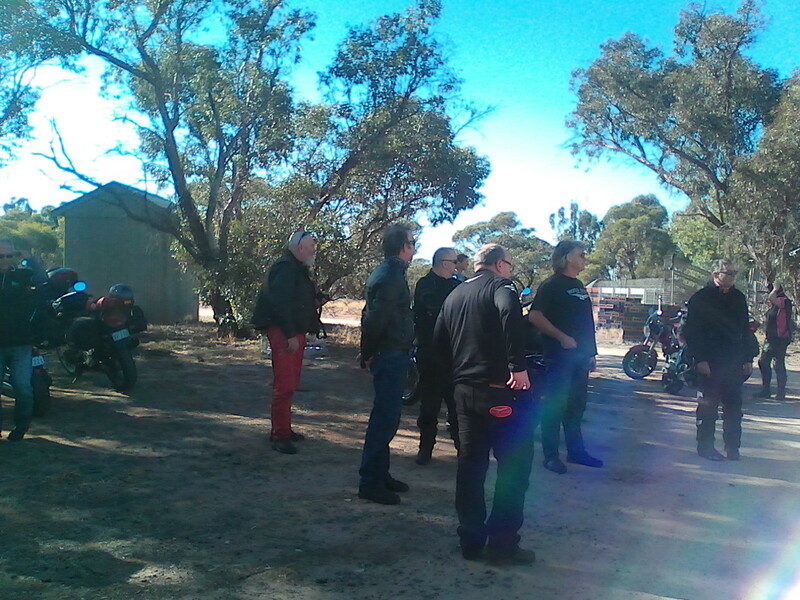 Most of the club camped in fine weather at the Boort Caravan Park on the banks of the lake. But we did it tough at the Pink Olive House just up the road. The Club tracked out to tour the nearby olive farm and refinery: 50,000 hectares of plantations. 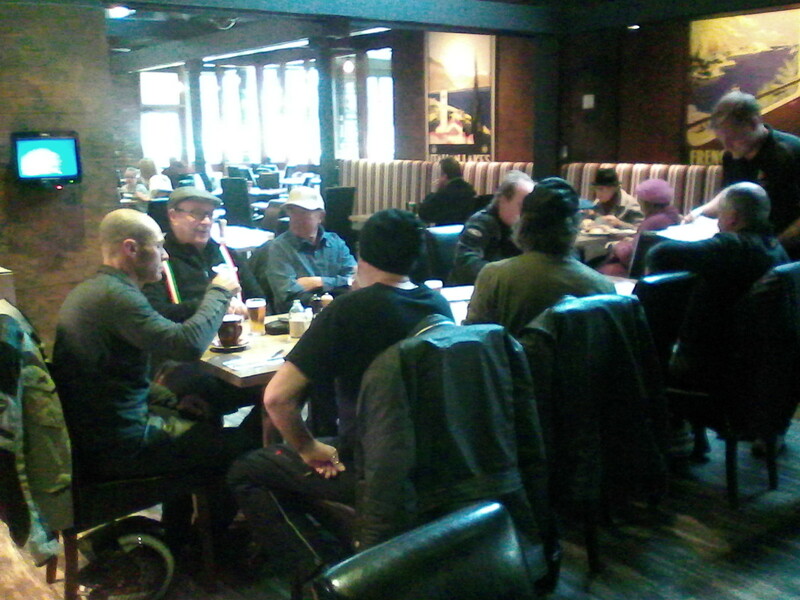 The Club met at the Railway Hotel for tea on Saturday night. The food was fair but there wasn’t much beer choice. Unfortunately the layout of the pub wasn’t conducive to standing around yacking and drinking so everyone hit the sack early. Like many country towns, Boort has an air of doing it tough with closed shops and not much activity in the evening. 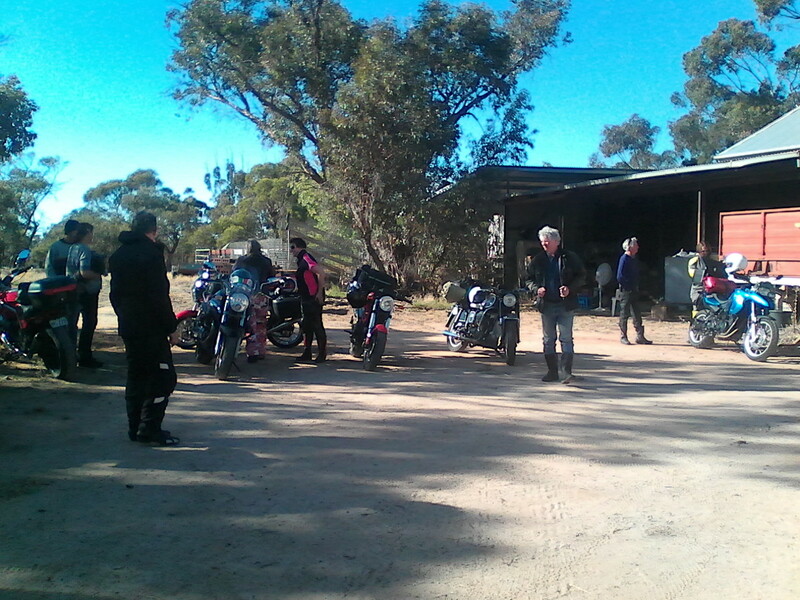 On Sunday we had breakfast at the nearby Boort Ski Club before heading out to visit Spanner Man, John Piccoli. The sculptures of welded spanners are impressive, as is his collection of birds. Jane and I made our own way home, stopping for lunch at Maldon. My worst fear – a crash! After a few days of rain, I took the Cali for a local run in dry, windy weather. 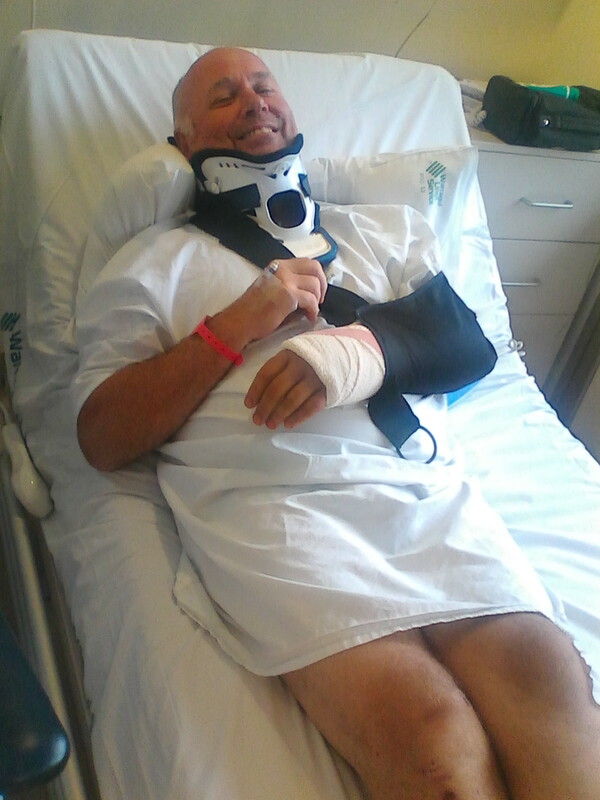 A few miles from home I crashed and spent 5 days in the Alfred Hospital, the state’s major road trauma centre. I have no recollection of the crash so the following is based upon other reports. 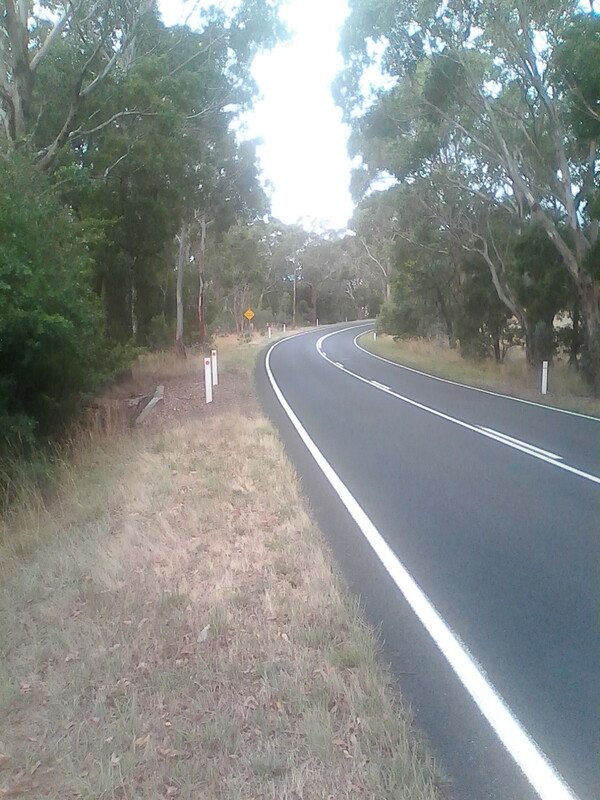 As I approached this bend, a kangaroo sped from the left and hit my bike, probably the front rotor. There wasn’t any skid mark, which suggests that I was taken unaware. 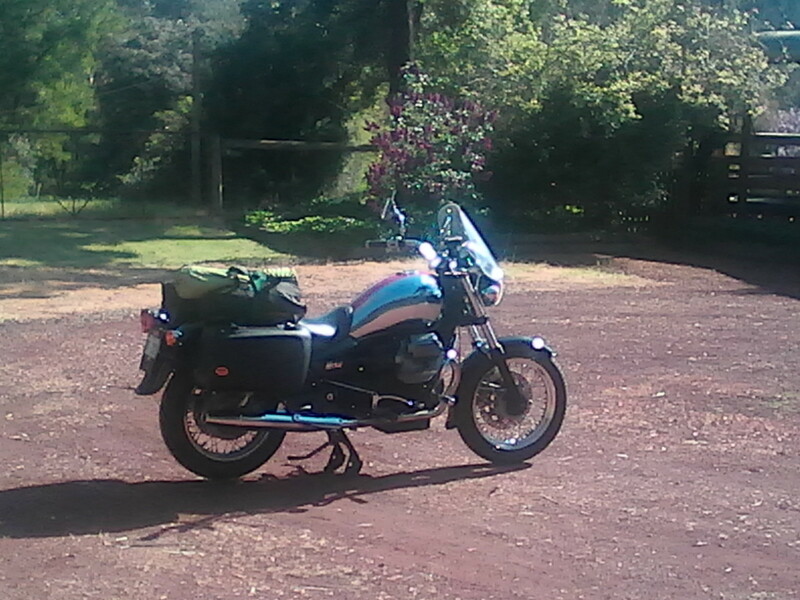 The Guzzi hit the road and speared off onto the edge straight ahead as the bend turned right. It seems to have flipped onto its other side at least once. I seem to have hit the road more on my left side, judging from my injuries, and tumbled. 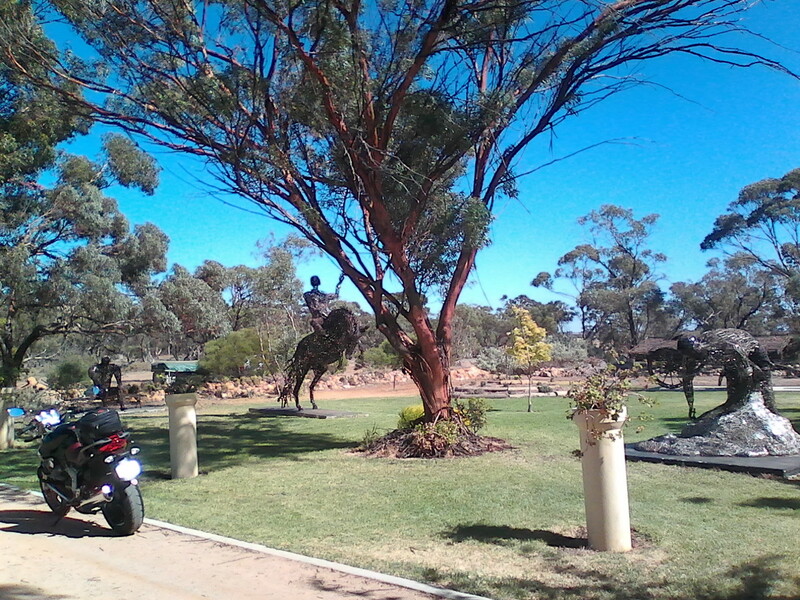 So the ‘roo was found dead in the foreground of this photo, and another vehicle found me sitting in the middle of the road near my bike, up at the bend, trying to remove my helmet and move off the road. I was able to give them Jane’s phone number and she arrived before the police but after the ambulance. A local farmer had seen me pass and said that I was doing about 80km/hr. 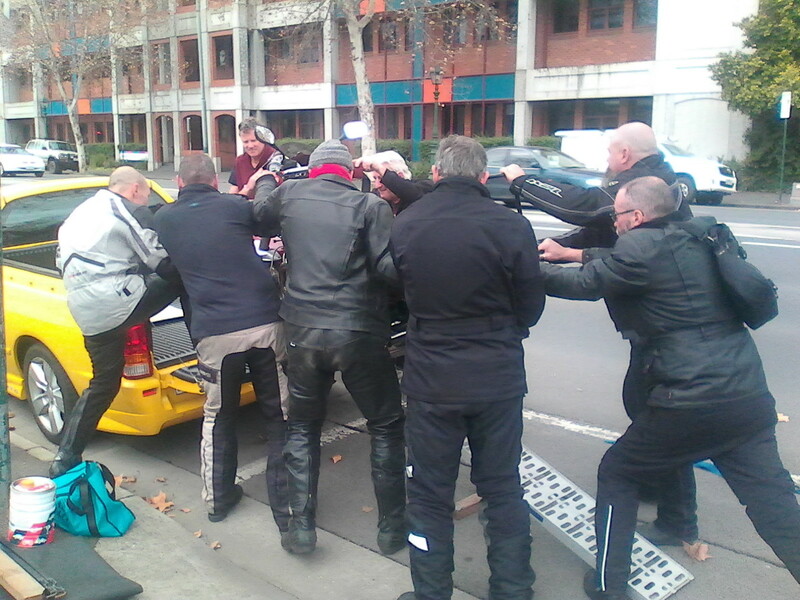 I have a vague recollection of the ambulance ride, laying on a hard board and running over every bump to Melbourne. The next day, everything hurt. I had a slightly fractured occipital condyle at the back of my head and a cracked scaphoid in my left thumb; kevlar burns to both knees and bruises to both elbows; mesenteric small bowel contusion and sore lower ribs ( I reckon that I hit the screen as I was ejected from the bike). My Neds kevlar jeans had been cut off me by the ambos but had done their job, my Tiger Angel leather jacket had held up well, with no grazing on my elbows, my Rossi boots showed toe wear, my left-hand elkskin glove had peeled back and allowed some gravel rash on the back of my hand, and my AGV helmet had numerous scrapes across the front and visor where I’d hit the road face-down (a demonstration of why not to wear an open-face helmet which I’d been thinking of doing). After a couple of days, I was able to get up and walk around. The Alfred staff had just the right blend of relaxed professionalism and humour – I guess they’ve seen it all before. 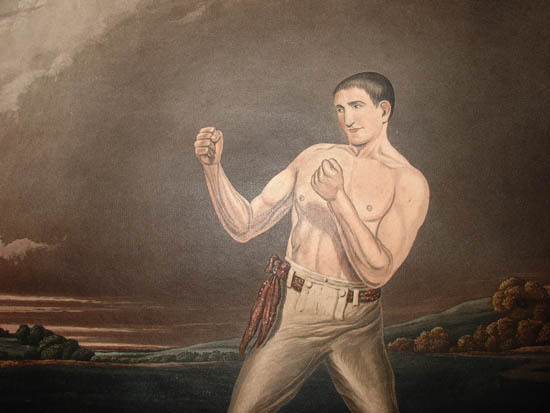 The other three jokers in my ward had come off push-bikes (one had hit a ‘roo) and had suffered more severe injuries than I – busted femurs, pelvises, etc and gravel rash. And my Cali looks like being a right-off due to a suspected twisted frame. I’ve put a bit of effort into looking after her, so I’m sad to see her go. Only 84,000km on the clock, I’d intended on always keeping her. Christmas Eve I cleaned the bikes and the car, moved junk around and generally tidied the Man-shed. 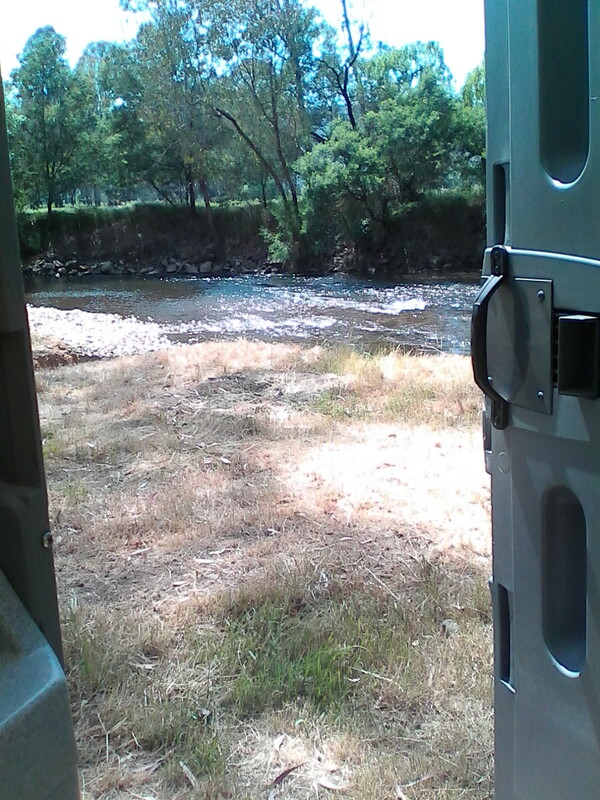 Sat down in my swivel chair with a cold Coopers Sparkling Ale from the Man-fridge. Mick and Paddy jumped up onto my lap and sat looking out the door – we like to do this while Jane mows the lawn. But she wasn’t mowing today as she entered to grab something from the Man-fridge which was, begrudgingly, being used for Christmas overflow. Two things happened simultaneously. Jane dropped a stubby onto the concrete floor which shattered…and my daughter appeared unexpectedly silhouetted in the door. In unison and in commotion, my two guardians leaped for her throat like the trained assassins which they aren’t. Digging their hind claws deeply into my thighs for maximum purchase, the black poodle-wraiths launched, howling with vituperation, eyes flashing red, They were two-thirds along their implacable trajectory when their tails started to wag. Bent over in pain, trying to stem the flow of life-blood, I observed out of one eye the flow of frothy cider over my pristine, oil-stained concrete floor, and out of the other, the wriggle-bummed apologies of that traitorous breed. Sucking down Coopers for its anesthetic properties, and refusing to waste it as a disinfectant, I was grateful that Christmas comes but once a year. Christmas Day dawned sunny and windless. The Chief and I went for a fang around the backroads for an hour or so, including a “spirited” run down our secret fanging strip. 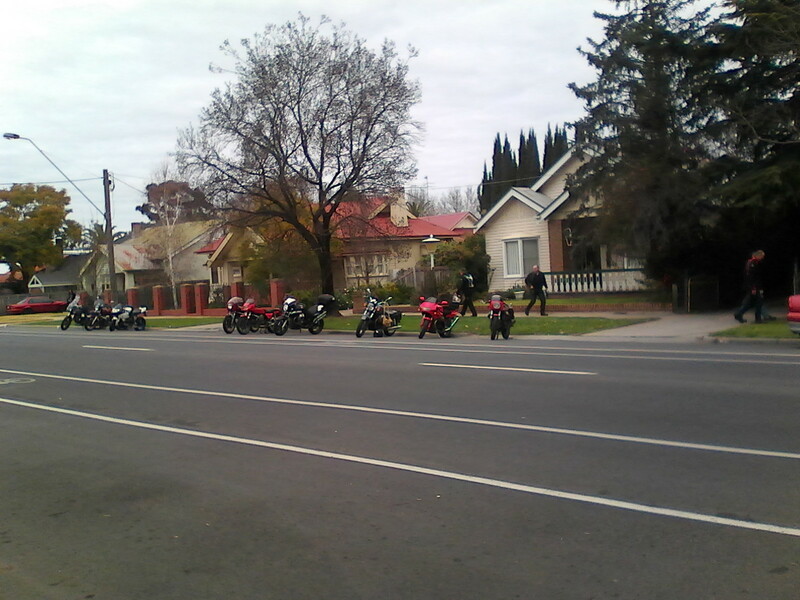 The “got to get to Mum’s for lunch” crowd were just getting on the roads as we returned home. 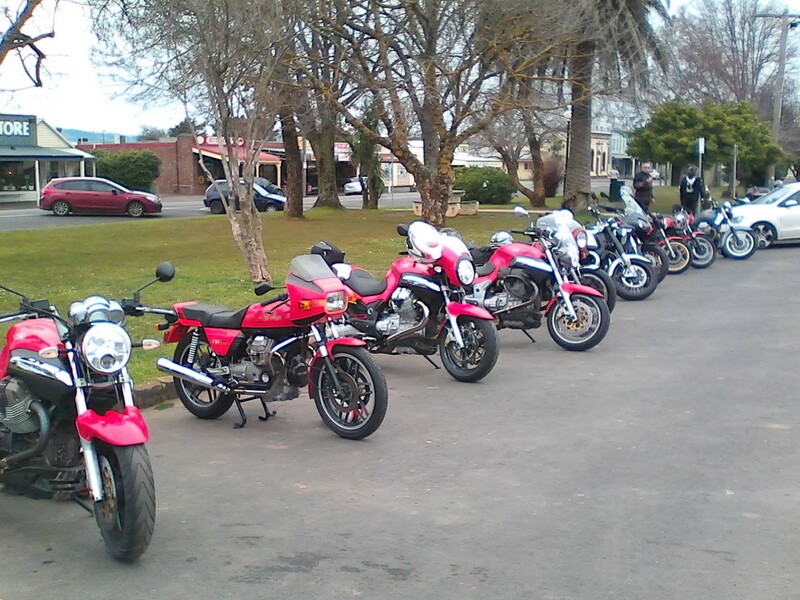 Spent last weekend at Edi for the Moto Guzzi Club’s annual Spaghetti Rally. Rolled up on Friday to help set up, but most of the work had already been done by a few of the club stalwarts. We were expecting a big turnout due to the great weather, but in the end, the crowd of 170 or so was about normal. My ’01 Cali Metal loaded up. 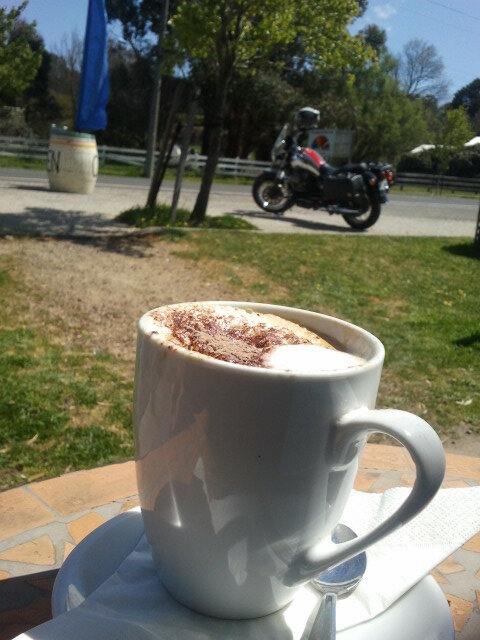 Coffee at the Snow Road Cafe, Milawa. 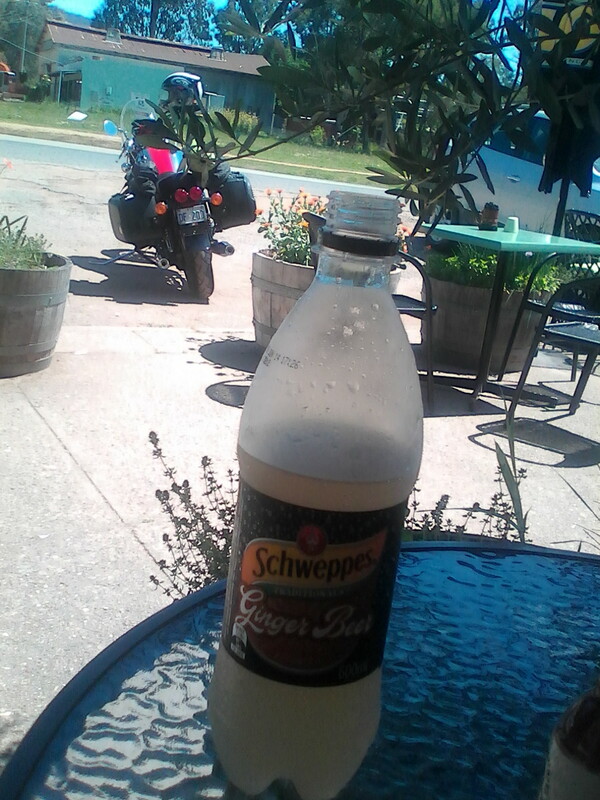 A coldie at the Whitty Cafe, Whitfield. Setting up camp on Friday. 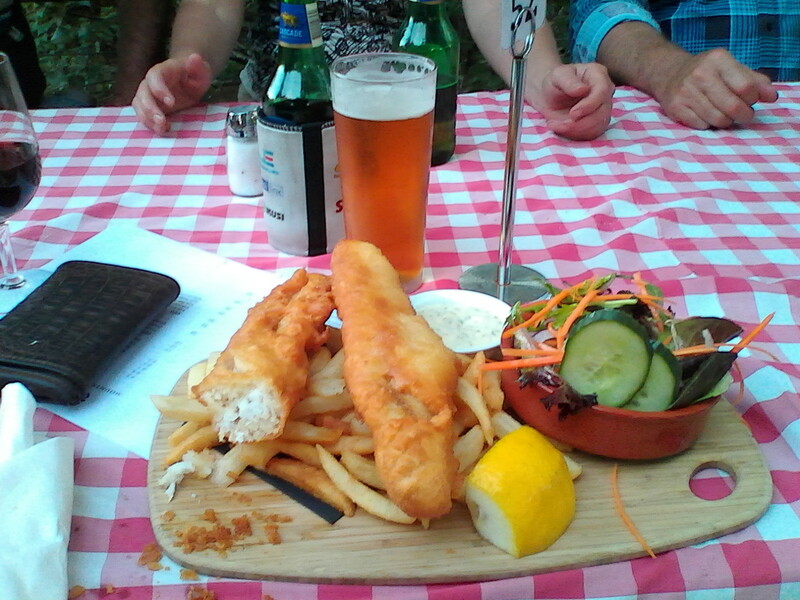 Dinner at the Mountain View Hotel, Whitfield, on Friday night. 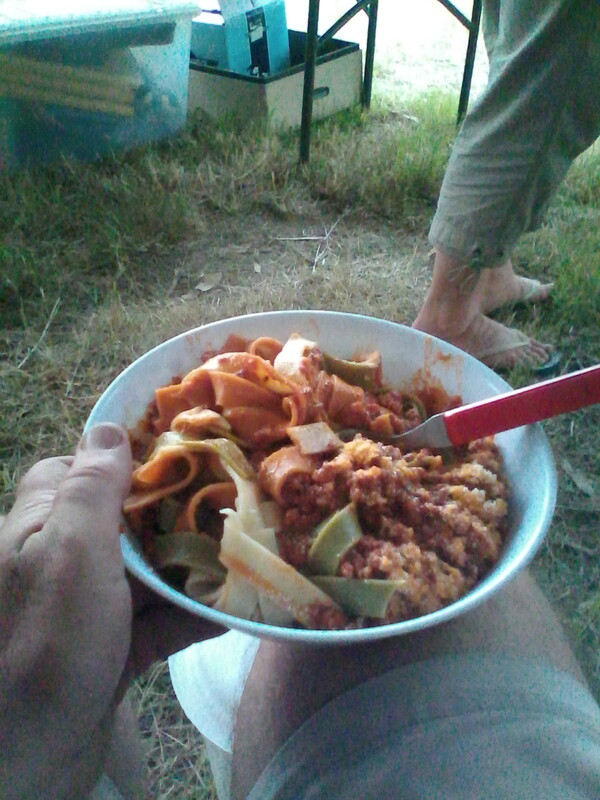 The queue for spaghetti, Saturday evening. The club made up the sauce during a “Bol-a-thon” a few weeks earlier. About to head off after packing up the club gear and a general site clean-up. Morning dawned cool – and early due to the start of daylight saving. 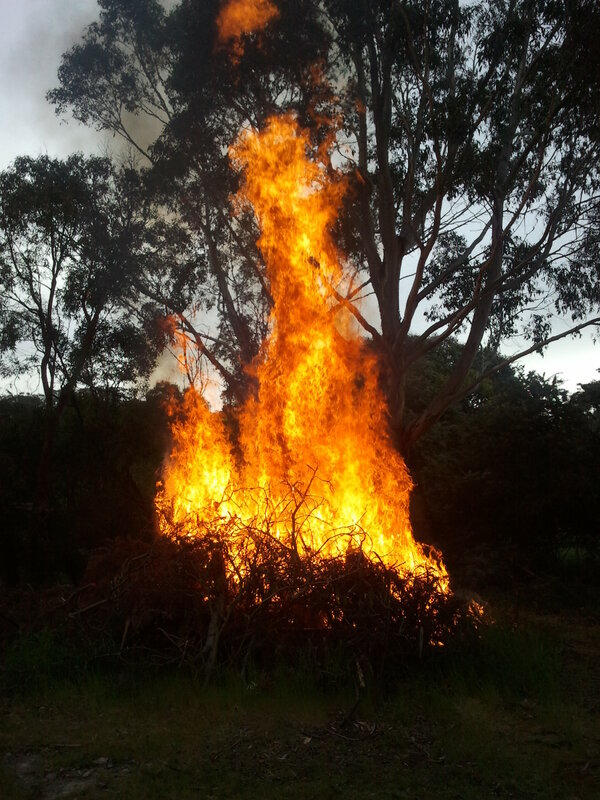 Time to let off a couple of bon-fires we’d accumulated over the winter. 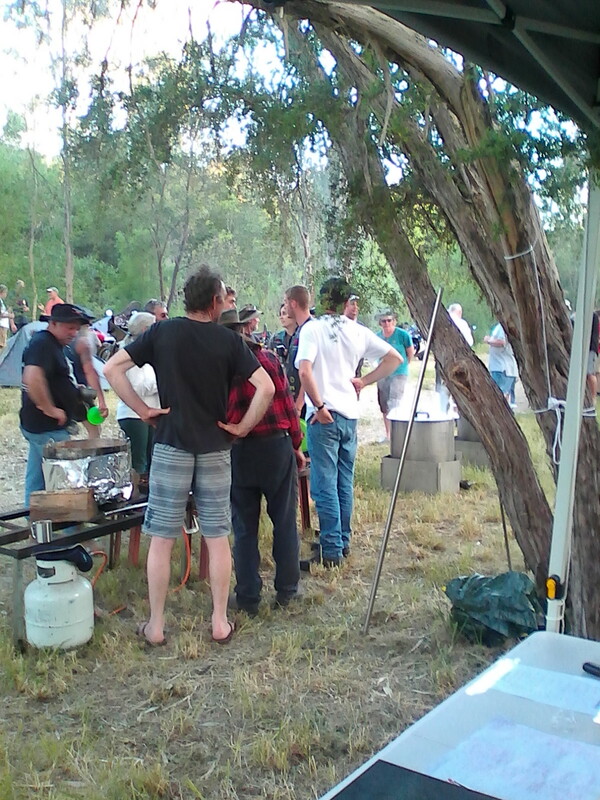 Landowners are required to clean up prior to the start of the summer fire season. After a couple of hours of poking and stoking, I could leave them smoldering along. I’d completed the 80,000km service on the Cali with new fork oil the final task. Time for a post-service blast in the (now) sunny day. Coffee at Taradale Wine and Produce. 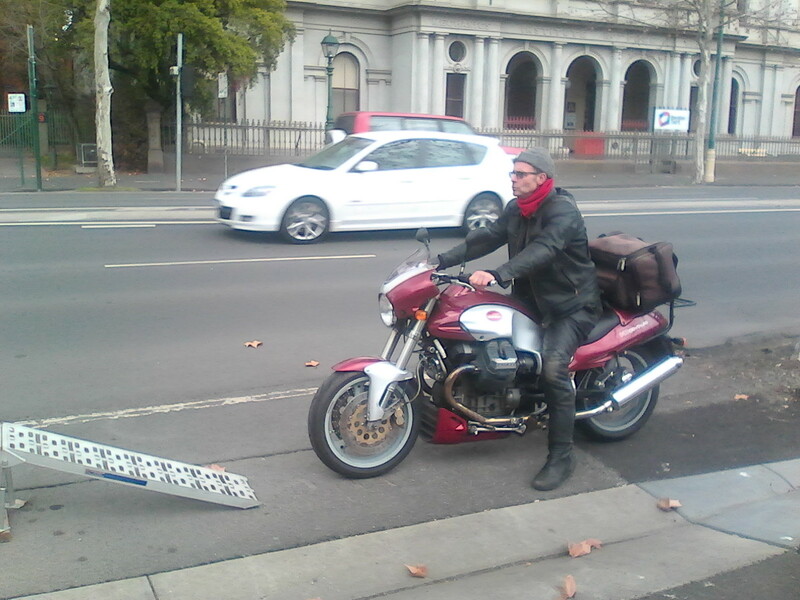 A new Moto Guzzi California went past – the first I’ve seen on the road.